SAGE4 is another female-fronted metal band on Chicago's local scene. They've been playing venues around the Chicago area, as well as travelling various states in the midwest as opportunity presents itself. Recently, they've been performing a series of acoustic sets at different Hot Topic locations. Currently working on new material, they are sure to be back on the local scene soon, ready to deliver top-notch live performances of their personal style of metal. Their sound reminds me of a blend between gothic metal and alternative rock. Lead singer Tracey Sage delivers vocals with smooth melodies and heart-felt emotions while guitarist Mike Walsh develops intricate riffs and chord progressions on guitar. A tight rhythm section keeps the groove heavy for this band. They have a full-length, self-produced album: Graves. It is available through their website for download, or on CD. 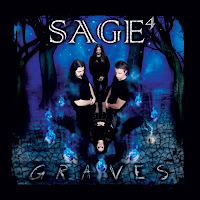 Listening to Graves will give you the full effect of SAGE4. A myriad of guitar techniques are exhibited throughout this album. Lyrics are sung with true emotion, and they often reflect on issues you feel are personal and inspiring. Different songs bring comparrisons to mind, from Alice In Chains to Megadeth, Lacuna Coil to Metallica. Check out their website to download, or order your own copy of Graves today! Poll Winner: Which song does not belong? In last month's reader's poll I gave you six songs, all with the word 'black' in the title and asked you to figure out which one does not belong. There were 2 songs by Black Sabbath (one with Ozzy, one with Tony Martin), a Slayer song (Spirit In Black), a Dio song, an Ozzy Osbourne song, and a Tony Iommi song. The 'winner' this time was Slayer, since they were to only option where no band member had played on a Black Sabbath recording. 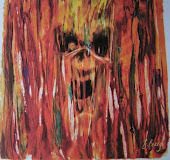 The song I chose, 'Spirit In Black', is from Slayer's monumental 1990 album Seasons In The Abyss. Last year, Slayer celebrated the 20th anniversary of 'Seasons' by performing it in it's entirety on the American Carnage Tour. I was lucky enough to attend one of those shows, but I'll review that concert a little later. Today, I'm focusing on Seasons In The Abyss. 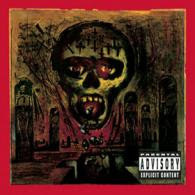 Many fans consider this album the last great album from Slayer's prime-years. It was a strong follow-up to 1988's South of Heaven, and closed the decade with a furious, thrashing consistency for Slayer. The album opens with the first 3 tracks blending together almost like a big medley. 'War Ensemble' kicks it off with a fast, thrashy, war-themed mosher. 'Blood Red' immediately continues with more lyrics depicting 'the massacre of innocent people'. Then we're hit with 'Spirit In Black', another Slayer classic, where the band again focus on horrific images of purgatory-esque suffering. Never shy to look on the dark side of human nature, Slayer take you on several twists and turns through an often psychopathic psyche with the different tracks on this classic album. By this point in their career as one of the 'Big 4' pioneers in thrash metal, they had remained arguably more consistent than any of their peers. Later in the 90's, metal would become less popular as grunge and alternative rock would rise in popularity. The effects this would have on veteran metal bands would differ from one artist to another, but Slayer would stay the course. Several years later metal began to rise again, and Slayer's contribution to its rejuvenation has remained significant to this day. But for now, take a moment to go back and appreciate one of the greatest albums from thrash-metal's golden era. I recently corresponded with the members of Hemoptysis, from Tempe, AZ, for an interview-the first interview here at Heavy Metal 107. Band-leader Masaki Murashita and company shed some light on Hemoptysis' style, direction and influences, as well as offering some personal background on how they got into heavy music. I hope you find this interview helpful & entertaining. I may have more interviews with independent bands coming in future posts. HappyHeadbanger: In previous conversations, you had mentioned you have family in Japan. Were you born there? How long have you been in the States? Masaki Murashita: Yes, I was born and raised in Japan. I left Japan when I was 15 to study English and I have been in the US since 2004. HH: First, I'd like to ask how your family & friends in Japan are faring with the efforts to recover from the earthquake, tsunami, and nuclear crisis? My thoughts and prayers are going out to the whole country of Japan right now, and I'm sure I can say the same for many of this blog's readers. MM: Thank you! My family is ok, but I was very shocked about this whole thing. However, Japanese people are strong and the victims are helping each other in this horrible situation to move forward instead of rioting, which is incredible. I am very proud of it. I truly hope things will settle down soon and everybody can get their lives back as soon as possible. HH: Let me take a moment to give our readers a chance to help the victims of these terrible disasters in Japan. Please click the link below to give what you can through the Red Cross. Every little bit helps, even if its just $1. I know that over a thousand people have voted in reader's polls on this blog before, and if all of them donated just $1, that still adds up to a thousand dollars. That would make a difference to any person whose home, or entire village, was washed away by the tsunami. HH: What was the first album you remember owning that made you love music? MM: Metallica's 'Master of Puppets'. That was the beginning. HH: What artist inspired you to play an instrument? MM: Dave Mustaine. He inspired me to play Metal. HH: What artists do you idolize? MM: Megadeth, Marty Friedman, Jeff Loomis, Gary Holt, Jeff Waters, Jason Becker, to name a few. HH: What band would you love to open for on a tour? MM: Megadeth, Exodus, The Absence, DAATH, Carcass, to name a few. Ryan Miller: Opeth, Meshuggah, Exodus, and Death Angel. Sunao Arai: Anthrax, Machine Head, Korn. HH: I retain an eclectic taste in music, in spite of the Metal-centric nature of my blog. If you do as well, what is the most atypical style of music you truly appreciate? MM: I do listen to many different types of music. There's so many, so I won't mention them all, but all types of music definitely inspire me. I'm learning every day. HH: Your debut album, 'Misanthropic Slaughter', describes several pessimistic and negative views towards humanity and society. To what degree do the song themes and lyrics reflect your personal opinions and beliefs on the state of our world's politics and society? MM: Each song was inspired by personal events. Travis and I both write lyrics for the band and each song has a special meaning to it. M.O.D. is the only song that might seem to be total fantasy, but the anger and revenge themes reflect our opinions and beliefs. I would say that the songs are 100% real when it comes to the emotion put into each song. The songs that involve murder are songs that were written when we felt like committing those acts, however we don't believe people should actually go out and kill other people, you know? The urge to kill and hurt other people is very strong sometimes, but we release that anger through songs because, ultimately, murder isn't worth throwing your life away. HH: What is your favorite song to play live? RM: Shadow of Death, the kids like the solo trade-offs. HH: Any covers in your set? If not, is there one you would consider? MM: Not as of now. I'm not a big fan of covers unless it's different and unique. HH: Metal music is often viewed as rebellious music, and stereotypically teens grow to love this music while their parents despise and discourage it. Was this the case in your own adolescence, or was your family supportive of your decission to pursue a career with this style of music? MM: My family is 100% supporting what I do and they are proud of it. Metal is the music that has passion and emotion. My parents never actually got into Metal before I introduced them to it, but now they actually appreciate Metal. HH: Music seems to be moving perpetually towards the digital format. Do you think that full-album format of song collections will be completely replaced at some point? MM: Maybe, but I know a lot of Metalheads prefer to have the physical copies (on CD) or vinyl, which I think is awesome because I'm one of those people who cares to see the artwork of the album. That's one of the decisions people have, to give it a shot and buy the CD or not. At the end of the day, an MP3 is just and MP3. The sound quality is nothing comparable to CD or Vinyl and you can't compare the experience of seeing the booklet and listening to the music with it. HH: Who in Heavy Metal do you think is overrated or underrated? MM: There are so many overrated and underrated bands out there. I wish labels would give those underrated bands a chance, give them tour support and get them some exposure because they deserve it. HH: Any particular song or artist(s) you are really into at the moment? MM: Sargon's debut album, 'In Contempt'. You really need to check them out. RM: Since I've been learning slide guitar lately it's been a lot of Duane Allman, Ry Cooder, Elmore James, stuff like that. SA: Victor Wooten. He is an incredible fusion bassist. HH: To wrap things up, here are a couple 'just-for-fun' questions. MM: I honestly can't think of a favorite. I don't watch very many movies. TT: Tough to answer this one. Top three: Good Fellas, Pulp Fiction, Braveheart. SA: I don't really watch movies often, so I don't know. HH: I would probably say Seven, or Memento. I love thrillers with a good twist at the end. How about a favorite book or author? MM: I doon't have a favorite author but I did like Lords of Chaos by Michael Moyniham and Didrik Soderlind. RM: The Stand and anything else by Stephen King. TT: I don't read enough books to have a favorite. SA: I don't read books. HH: Myself, I consider Stephen King my favorite author (and The Stand is one of my top five from him), however I feel like mentioning Lamb: The Gospel According to Biff, Christ's Childhood Pal, by Christopher Moore as a recent favorite of mine. Great for a ton of laughs. HH: Last question. Who is your favorite band, or what is your favorite album? MM: Megadeth, The Absence, Izegrim, Sodom, Exodus, to name a few. RM: Testament. Favorite band of all time. TT: Favorite band: Slayer. Favorite album: Reign In Blood. HH: My favorite... well, if you've been reading this blog, then you have some ideas of who my favorites are. Keep reading! A very grateful 'thank-you' to Hemoptysis for this interview opportunity!